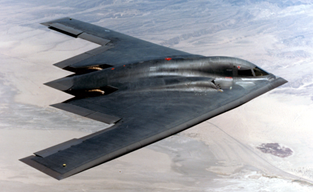 Modern Air Power is a simulation of air warfare in the missile age from the time of the Vietnam War to present day. Each release consists of a series of scenarios based on historical or hypothetical situations. The simulation is continuous-time (from real-time to 10x real-time). Modern Air Power runs on both Windows PCs as well as Android and iOS tablets. This User Manual covers the Android and iOS versions of Modern Power. Spotting and Identification - An explanation of how entities are spotted and identified. Maneuver - How to maneuver entities on the main chart. Firing - The rules of firing and bombing. Specialized Features - Features not covered by the other sections. Mission Types - A list of the mission types. Press your finger on the screen and then move or swipe your finger to scroll the chart. Press two fingers on the screen and then pinch or spread your fingers to zoom out or in. Tap your finger on a flight on the chart to select that flight. Double tap an air base on the chart to see a list of all the flights at that air base. Press your finger on the screen, hold it (long press), then move your finger to a location and release it to give an immediate order to a selected flight to fly to that location. Double tap the screen and hold your finger on the screen (long press), then move your finger to a location and release it to give a deferred order to the selected flight. Press your finger on the screen and then move or swipe your finger to scroll the area. Double tap in the area to toggle zoom-in and zoom-out. Tap your finger in the area to select a flight speed, a flight altitude, an ordnance, the speed of the game, a new scenario, or menu command. There are seven menus in the Flight Information Area that you can use to give commands. Top on the name of a menu to select it. Depending on which menu you select, you will be presented with various options. The Command Menu allows you to give commands to the selected flight. Drop Fuel Tanks - Drop any external fuel tanks carried by the selected flight. Dispensing - Toggle dispensing, such as chaff, by the selected flight. On/Off Passengers - Load or unload passengers from the selected flight when it is located at an air base. Load Cargo - Load cargo on the selected flight when it is located at an air base. Unload Cargo - Unload cargo from the selected flight when it is located at an air base. The Function Menu allows you to establish certain automatic functions for the selected flight. Depending on the type of aircraft and what it is carrying, only certain of these options apply to any given flight. Auto-Fire - This option causes the selected flight to automatically fire at enemy aircraft within range. Auto-Return - This option causes the selected flight to automatically return to its air base when it is low on fuel (Bingo) or out of ammunition (Winchester). Auto-Intercept - This option causes the selected flight to automatically intercept enemy flights. Auto-Rescue - This option causes the selected flight to automatically fly to rescue Downed Crews. Auto-Refuel - This option causes the selected flight to automatically fly to a tanker and refuel when it is low on fuel. The Status Menu allows you to get information about the current scenario. Rules of Engmnt - Displays any Rules of Engagement that apply to the current scenario. 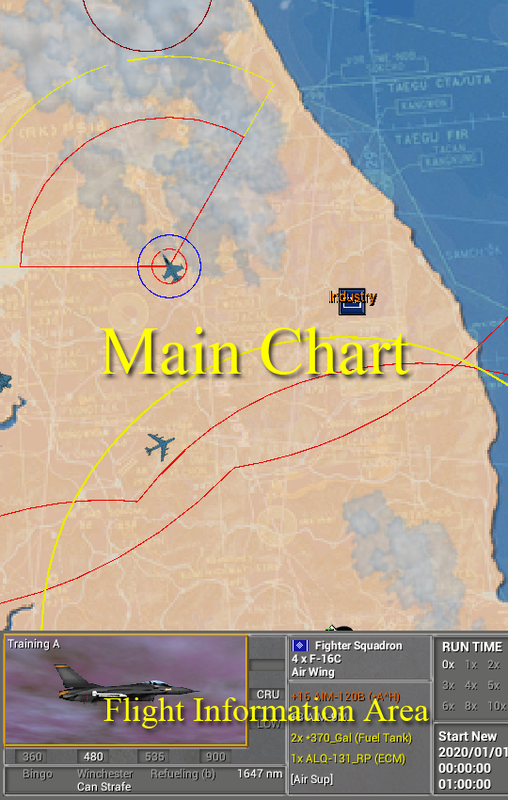 Timed Arrivals - Displays any flights which are Timed Arrivals in the current scenario for the Blue side. Victory Conditions - Displays the current state of the Victory Conditions for the current scenario. The View Menu allows you to control information that is displayed on the Main Chart. Aircraft Range - Toggles the display of aircraft range. Ground Radar - Toggles the display of the range of ground-based radar. Ground Weapons - Toggles the display of the range of ground-based weapons. Names of Map - Toggles the display of names. Status Values - Toggles the display of status values. Map Elevations - Toggles the display of map elevations. Ground Map - Toggles the display of the map. All Orders - Toggles the display orders for all flights. Generic Orders - Toggles the display of Generic Orders. Missions - Toggles the display of flight missions. Special Airspace - Toggles the display of Special Airspace. The Display Menu allows you to control how information is displayed on the Main Chart. Organization - Toggles the highlighting of flights that are in the same organization as the selected flight. Bingo - Toggles the highlighting of flights that are Bingo (low on fuel). Winchester - Toggles the highlighting of flights that are Winchester (out of ammunition). Package - Toggles the highlighting of flights that are in the same package as the selected flight. Map Locations - Toggles the display of names locations on the map. Flight Names - Toggles the display of flight names. Air Base Names - Toggles the display of Air Base names. Target Names - Toggles the display of Target names. 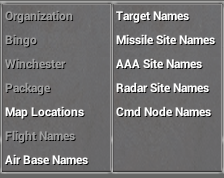 Missile Site Names - Toggles the display of Missile Site names. AAA Site Names - Toggles the display of AAA Site names. 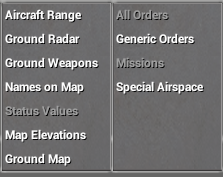 Radar Site Names - Toggles the display of Radar Site Names. Cmd Node Names - Toggles the display of Command Node Names. The Settings Menu allows you to change settings that apply to how the program works. Aircraft Sounds - Toggles the playing of aircraft sounds. Combat Sounds - Toggles the playing of combat sounds such as missiles and bombs. Auto-Fire Initial - When set causes all flights to have the Auto-Fire option set when a scenario is first started. Auto-Return Initial - When set causes all flights to have the Auto-Return option set when a scenario is first started. Range Envelopes - When set displays the range of ground radar and weapons to be shown using envelopes instead of individual range circles. The Help Menu provides you with additional information and help about the program. Quick Reference - Displays a short list of the gestures supported by the program. Scenario Briefing - Displays an explanation of the current scenario and how it should be played. Getting Started - Displays a help file showing you how to play the Getting Started scenario. User Manual - Displays this User Manual. About - Displays information about the program.